MI-303L is a heavy-duty tilt TV mount for a 42 inch to 70 inch TV. It will safely secure your precious flat screen TV to any wall. It is one of our top selling tilting wall mounts. Don't risk your TV with the cheaper models! Cheaper mounts use lower grade and thinner materials. MI-303L is made from 2mm thick cold-rolled high-grade steel. With its rigid reinforced wall plate and two adjustable brackets it can safely hold your flat screen TV up to 220 lbs. MI-303L is one of the largest tilt mounts you can find on the market. With its adjustable brackets it is compatible with almost TVs on the market from 42" to 70" (some up to 80"). VESA compatible 300x300, 400x200, 400x300, 400X400, 600x200, 600x300, 600x400, 700x400, 700x450, 750x450, 800x450, 850x450. Fits TVs with installation holes up to 34" apart horizontally and 17.7" apart vertically. VESA measurements are the spacings of the holes on the back of your TV. Please measure these to ensure that your TV is compatible with this bracket. MI-303L features easy-to-turn adjustable tilt knobs on the brackets to securely tilt your TV up to 15 degrees both up and down to optimize your viewing angle from your seating area. The back plate features four large cut outs to mount over plug sockets and Ariel plates and to route cables. Includes integrated bubble level for alignment. The vertical brackets include a safety screw to safely secure the TV to the wall plate. It is very easy to install. This mount ships with hardware to assemble and mount in stud, masonry, or drywall. Easy-to-follow installation instructions included. The wall plate dimensions are 36.5" (W) x 9.5" (H), the brackets are 20" (L). 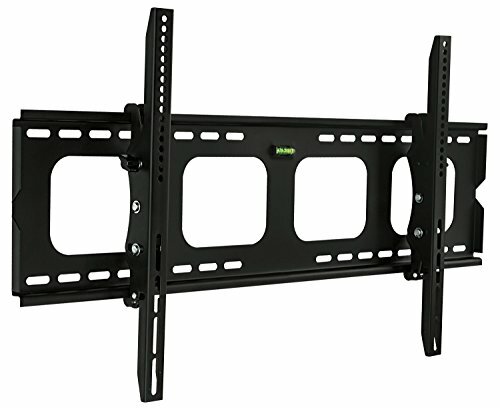 Universal design TV wall mounting brackets fit virtually all flat-panel TVs from 42" to 70" (some up to 80"). VESA compatible 300x300, 400x200, 400x300, 400X400, 600x200, 600x300, 600x400, 700x400, 700x450, 750x450, 800x450, 850x450. Fits TVs with installation holes up to 34" apart horizontally and 17.7" apart vertically. Do not trust your precious TV to a flimsy and cheap wall mount. This heavy duty TV mount has carrying capacity of 220 lbs. This bracket is one of the strongest brackets available on Amazon - Constructed from 2 mm thick Reinforced Steel.